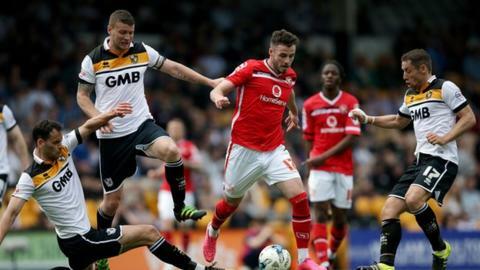 Port Vale caretaker boss Michael Brown says his side must win both their final two League One games to give themselves a better chance of staying up. Going into Tuesday's Midland derby at mid-table Walsall, Vale are four points adrift of 20th-placed Gillingham. A Vale draw would mean having to win at Fleetwood on Sunday, while hoping for a seven-goal swing on Gillingham, who go to Northampton on the final day. "We've got to win. We'll certainly take the game to them," Brown said. A Vale victory would at least give them a realistic chance of remaining in League One, as well as ensuring that both Shrewsbury Town and Bury would both need something from their final games, at Oxford and Southend respectively. Brown told BBC Radio Stoke: "If we play like we can, with that endeavour, we can get a result and take it into the last game. "Then at least we'll have given ourselves a chance and, from there, it's a case of 'never say never'." Brown again finds himself hit by injuries, including captain Ben Purkiss, who is a doubt for the meeting with his former club. "We're patching a few up. We've had freak injuries. It's strained circumstances and is very frustrating, but that's the cards we've been dealt." Although a Vale defeat would relegate them, Brown can at least be encouraged by their record at the Banks's Stadium, where they have lost just once in six visits. Vale's survival hopes were hit by Saturday's 2-0 home defeat by Bolton in a match that was marred by a pitch invasion which followed the Trotters' opening goal. Play was suspended for 12 minutes, which eventually involved fans from both sides jumping the barricades and getting involved in clashes with each other, leading to four arrests. "It was very disappointing," said Brown, whose side were reduced to 10 men after 33 minutes when striker Rigino Cicilia was sent off. "When security staff are taking the players off the pitch and talking safety, it's very worrying. "I understand fans want to celebrate but there is a fine line with how far people take it." While defeat for Vale at Bescot would send the visitors down to League Two, Walsall manager Jon Whitney has sympathy for his opposite number, recognising that it has not been straightforward for Brown, since taking over in mid-season from Bruno Ribeiro. "He was left with players from the previous regime who have not been quite good enough for him," Whitney told BBC WM. "He tried to bring in people in January but didn't really get his targets. "I saw their game on Saturday and, before the sending-off they were the better side against Bolton and should have scored." But Whitney's only concern is getting his own team back on track after a poor result at relegated Coventry on Saturday. After a game in which he lost defender Eoghan O'Connell, sent off for a second yellow card, Whitney apologised to the travelling fans for a lacklustre first-half performance. "It had an end of season feel to it," he said. "Some of them will have lost their names on the shirts. And my only concern is winning on Tuesday night and remaining unbeaten in our last two matches."